The liver is responsible for more than 500 bodily functions. These functions include bile production; blood glucose management; glycogen storage; the production of enzymes and hormones; the elimination of dozens of toxins, viruses, and bacterium; and vitamin and mineral absorption. A liver that is sick or that doesn’t work properly is the basis for many chronic illnesses. Liver diseases are very common in North America; in fact 400 000 people are diagnosed with cirrhosis of the liver every year in the United States (NIH 1994) and 2 000 000 North Americans suffer from significant liver problems caused by, for example, drinking too much. These crises themselves are usually due to a malfunction of the gallbladder (which often causes pain in the right shoulder, abdominal pain, vomiting), stomach ulcers or gastric reflux (often calmed by taking medications) or intestinal problems (which manifest as gas, abdominal pain, aerophagy (swallowing too much air), burping, diarrhea or constipation). Without being in crisis, the liver can, however, still be inflamed. This can produce digestive problems or a sense of heaviness in the liver area (under the ribs on the right side). In this case, one will have to avoid eating certain foods, such as stews, fried foods, fatty meats, white sugar, foods containing additives, and alcohol, at least for a few days or a few weeks—long enough for the digestive functions to start doing their jobs properly once again. When you drink alcohol, drink a lot of water to avoid dehydration and the unpleasant effects that go with it. To care for a sick liver, it is always a good idea to watch your diet, and also to take 1 to 2 Hepatik Defense capsules three times a day for 4 to 6 weeks and to put a hot water bottle on your abdomen to activate proper liver function. Choline: Long considered as a B vitamin, choline was recognized in 1998 by the US authorities as an essential nutrient. It is the precursor of acetylcholine, a neurotransmitter that plays an important role in muscular control and memory. It is also used in the synthesis of lecithin (or phosphatidylcholine), an essential component of cell membranes and bile, which helps digest fats. Inositol: The level of inositol in the nerves declines with age, as well as the speed of the reflexes. Considered the old age vitamin, inositol or vitamin B7 is a veritable tonic of nutrition for the nervous system and the liver. It mobilizes fats and helps prevent their accumulation. 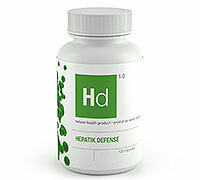 It encourages Phase 2 of the detoxification of the liver. NAC (N-Acetylcysteine) is the precursor of glutathione peroxidase, one of the most powerful antioxidants in the human body. NAC protects the liver against free radicals, against the side effects of medications and against many other environmental toxins. medicine for treating the liver. Its virtues are manifold: antidiabetic, anticancer, regulator of cholesterol and triglycerides, a powerful detoxifying agent, able to regenerate liver cells, and its famous cytochrome p 450 of Phase 1 of detoxification. Artichoke: Artichoke reduces cholesterol levels and reestablishes the balance between LDL and HDL; it encourages proper digestion and an increased elimination of toxins. It is also hepatoprotective and choleretic or cholagogue (increases bile flow). Recommended Use or Purpose: Helps to support liver function. Hepatoprotectant/liver protectants. Used in Herbal Medicine to help increase bile flow (cholerectic). Recommended Dose: Adults: Take one capsule three times daily with meals providing protein, or as directed by a qualified healthcare practitioner. Duration of use: Use for a minimum of 3 weeks to see beneficial effects. Consult a healthcare practitioner for use beyond 6 months.